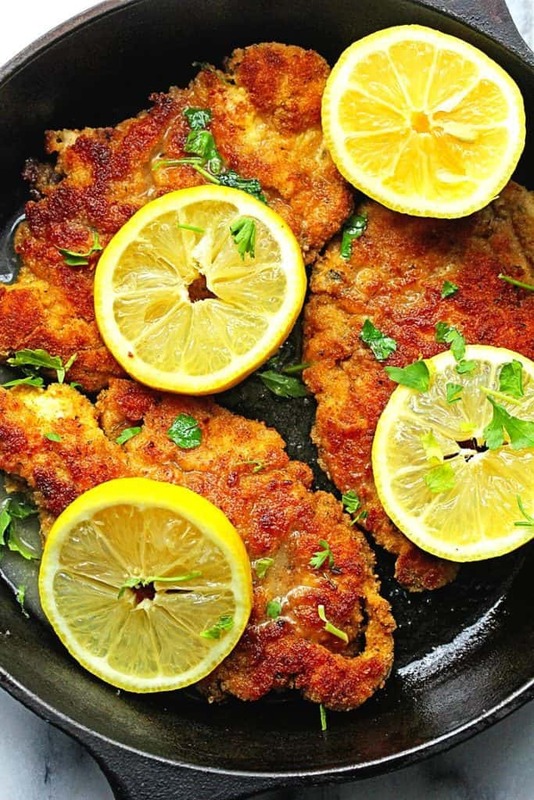 Breaded Chicken Piccata Recipe – Delicious bread crumb crusted chicken paired with a classic lemon wine sauce. 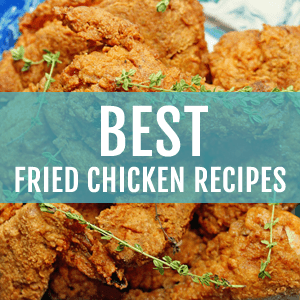 One of the best breaded chicken and chicken breast recipes on the internet! My love of chicken and citrus runs deep. 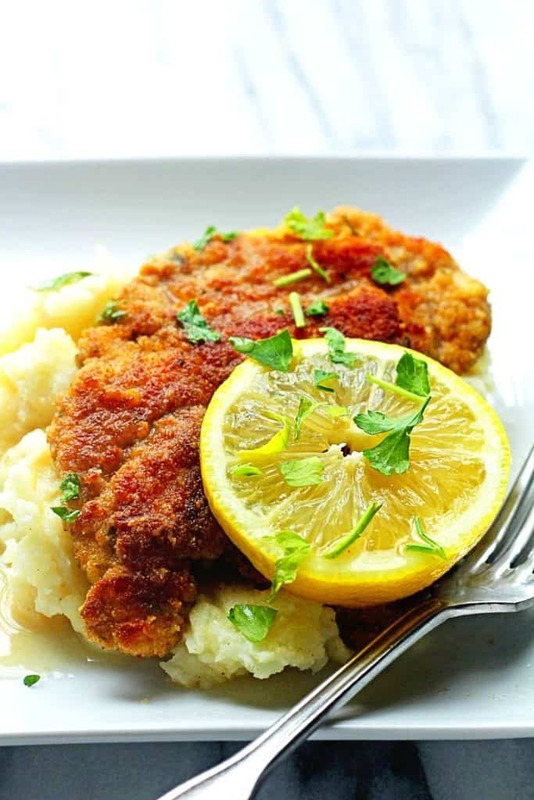 I first introduced you to this amazing savory combo with my lemon roast chicken and potatoes recipe, and now I am back at it again with this breaded chicken piccata recipe. 1. It’s breaded! I simply can’t resist almost anything dredged in flour and breadcrumbs. 2. It’s drenched in a simple lemon wine sauce. The combination of citrus flavors and chicken can’t be beat! 3. It’s so simple and quick to make. 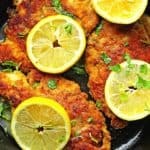 I love my chicken breasts for this breaded chicken piccata recipe to be as thin as possible. 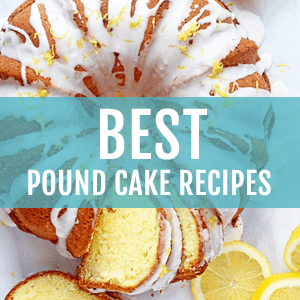 You can either find it like this at your grocery store, or you can pound it yourself (with a mallet, rolling pin or any kitchen utensil that can do the job fast and easy) to make it thinner. This helps the chicken cook faster and tenderizes it even more. The breading is created using beaten eggs, flour and bread crumbs (all in separate bowls). Dip your thin chicken breasts in the flour, egg mixture and bread crumbs and repeat at least once. This dredge creates a flavorful impact with a golden brown and crispy outer layer alongside a fast lemon butter sauce, which you add to the top of your cooked chicken. This breaded chicken piccata can be served over a pasta like linguini or over a bed of mashed potatoes, which is my preference along with my easy homemade garlic bread recipe. The softness of the mashed potatoes matched with the crunch of the chicken is so delicious. I do a small happy dance in my chair after each and every bite, just for good measure. I originally started using the recipe for Ina Garten’s chicken piccata many moons ago but it has gone through quite a few alterations over the years to create my breaded chicken piccata recipe. It was the perfect inspiration for this recipe. As always, thank you Barefoot Contessa! 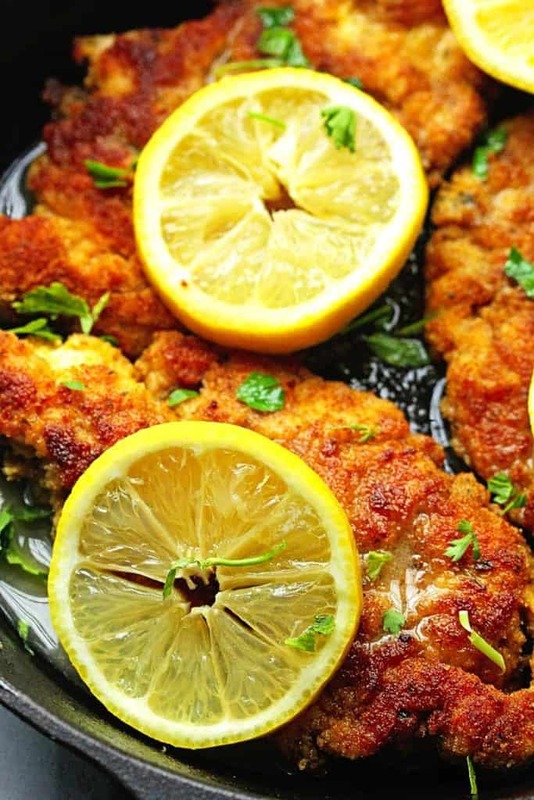 Delicious bread crumb crusted chicken paired with a classic lemon wine sauce. One of the best breaded chicken and chicken breast recipes on the internet! Season thin chicken breast pieces with salt and pepper to taste. Add flour to a separate shallow bowl. In another bowl, add beaten eggs. In a 3rd shallow bowl, whisk together breadcrumbs and paprika. Dip seasoned chicken one at a time into flour then eggs then breadcrumbs coating both sides then place on a baking sheet to rest. Repeat with all chicken breasts until complete. Heat 2 tablespoons of olive oil in a medium sized saute pan over medium heat. Add two chicken breasts at a time to pan and cook on both sides until golden brown. As each piece is finished, place the chicken breast on a baking sheet lined with parchment paper. Place the chicken in the oven when it is done and continue the cooking process (starting with adding more olive oil with each cook) until all chicken is cooked and placed in the oven. Clean the saute pan and put back over medium high heat. To make the lemon sauce, add white wine and lemon juice to pan and boil until reduced by half. Season with salt and pepper to taste then turn off heat and add butter, swirling in the sauce to completely melt. To serve, ladle sauce over chicken and garnish with lemon slices and parsley. Holy cow!! The breading on that chicken looks amazing! Pass me a plate of potatoes and this chicken for sure! Comfort food for life!!! Go comfort food! It will always have my heart! You had me at lemon wine sauce….. seriously though I LOVE chicken piccata and my boyfriend pretty much only likes chicken, so this is going on our dinner rotation! Girl this looks totally amazing! Love this quick weeknight meal! I love how this dish is quick and it involves lemons. It looks delicious. Lemons are always the winner. I’m with you on the potatoes Jocelyn! 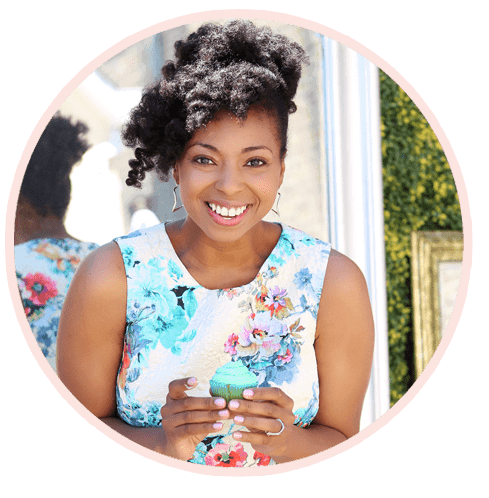 And seriously, can I watch you for a day – your photos are ridiculously stunning! Awww you are so sweet. Gosh my secret is I have no idea what I’m doing haha. How can I get this for dinner STAT?! This is so delicious Jocelyn! What a fabulous meal! I love lemon butter and anything breaded wins in my book. This reminds me of a dish my husband likes to make- he calls it Milanese and it’s very similar only with garlicky olive oil in place of the butter, and he sprinkles capers on top. It’s out one of our favorite dinners! I love your husband. Great taste! How about we say some wine for the chicken, and we split the rest! 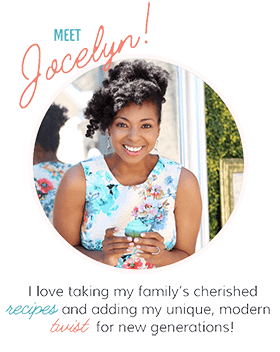 LOVING your version of chicken piccata, Jocelyn! Loving all that crispiness! Pinned! Oh this looks heavenly, Jocelyn. Love the white wine lemon sauce. Yum! Can’t go wrong with a wine sauce. Mercy, this looks divine, Jocelyn! Chicken Piccata is such a delicious dish – you made me so hungry with this one! This looks amazing, Jocelyn! Love chicken piccata – it’s one of my fave recipes! 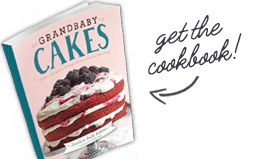 Need to try your recipe ASAP! Gosh isn’t chicken piccata sooo good? Love it too! Yum! Looks like the perfect weeknight meal – and I really can’t pass up anything that’s breaded. Such comfort! I adore anything breaded too! I’m coming over for dinner! This sounds delightful. I love chicken piccata! I love it too. One of my faves! Love chicken piccata! It’s so nice and easy and full of lemony flavour! I know! Same here Kevin! 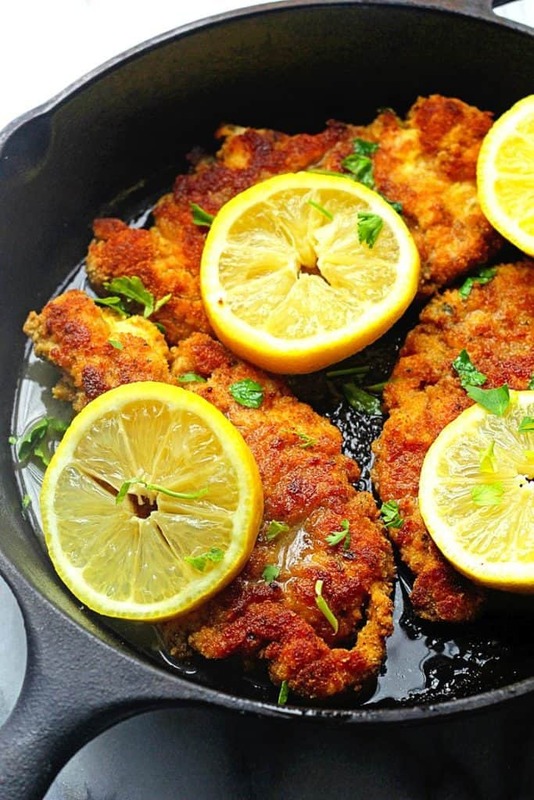 Breaded chicken and citrus make an amazing combo! What a satisfying meal. Perfection on a plate! I don’t want to wait for dinner to eat this! Its perfect for breakfast too! J, my love of chicken and citrus runs deep too!!! I LOVE chicken piccata!!! Oh my gawd, can’t wait to try this!!! and you can’t go wrong with adapting something from Ina! Exactly Gosh I love me some Ina! Looks SO delicious – I have decided, this needs to be in my mouth.